L-Shaped Depression - What Does It Mean? 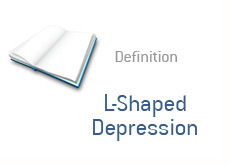 What is the definition or meaning of a L-shaped depression? There are different types of economic downturns. You have your V-shaped, U-shaped and W-shaped recessions, all of which we have covered on this site before. In addition to these three types of downturns, there is also the L-shaped depression, which is (by far) the worst of the four. The L-shaped depression is a doomsday scenario for any economy. The L-shaped depression is what US policy-makers are desperately trying to avoid with their recent moves to re-inflate the US economy. In a typical recession, you have a sharp downturn that is (eventually) followed by a return to growth. In a L-shaped depression, you have a sharp decline in the economy that is followed by years of minimal or non-existent growth. Think of the letter L - you have a quick drop-off in the economy, followed by a long period of time when the economy continues to flat-line. That is the L-shaped depression. In the L-shaped depression, there is no recovery after the economy suffers a tremendous fall. The most recent example of an L-shaped depression took place in Japan in the 1990s. This subsequently became known as the "Lost Decade". Prior to their collapse, Japan's economy was the toast of the planet. Real estate values were jumping through the roof, as was the Japanese stock market. Many new millionaires were being created as the world celebrated the "miracle" of the Japanese economy. The carpet was then pulled out from underneath Japan's economy. The real estate and stock market bubbles popped, the economy crumbled and suddenly the government was in a race to save some of their biggest banks from collapsing. The economy didn't really show any signs of recovery until 2003, making for a 10+ year period when economic activity in Japan was completely moribund. The real estate and stock markets in Japan still haven't recovered (not even close), and the original collapse happened 20 years ago. This is the L-shaped depression. This is what the higher-ups in the US government (and other governments worldwide) are desperately trying to avoid at all costs.